Green Communication Apprehension, a photo by timtak on Flickr. It has been made illegal, by green regional ordinance, to give away free plastic bags at supermarket cash registers. Anyone who has taught English in Japan knows how difficult it is to get Japanese students to speak. Is it because they are ashamed of their poor English, or suffer from "evaluation anxiety" (Cultrone, 2009)? No, it appears not. Communication research (McCroskey, Gundykunst, Nishida, 1985) has found that Japanese are just as anxious speaking in Japanese as they are in English. In other words the Japanese suffer from a fundamental Language-Communication-Anxiety, rather than any Foreign Language Communication Anxiety, or classroom Evaluation Anxiety. 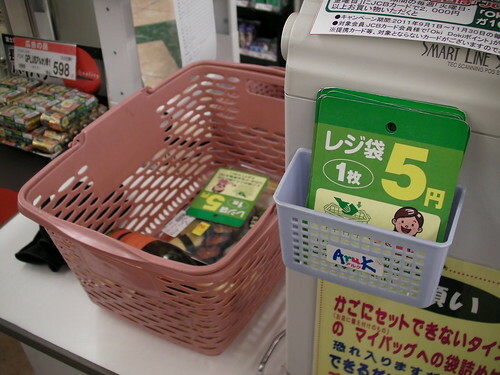 The Japanese tendency to wish to avoid linguistic communication is shown in their propensity to wish to avoid having to speaking to the staff at supermarket cash registers. Rather than saying "and two polythene bags please" they put two of these green cardboard symbols into their shopping basket to indicate the same thing. The Japanese are happy to communicate with symbols such as these. Perhaps they'd be good at English sign language. I find it works quite well to take a whiteboard to class and have learners translate my Japanese writing into English speech. So far research (e.g. Kondo, Ying-Ling, 2004) has failed to find the reason for, or strategies to prevent, Japanese communication apprehension. I theorise that it is equivalent to Objective Self Awareness in the linguistic dimension. Westerners feel uncomfortable if they are put infront of mirrors and required to see their visual self representations. Japanese feel uncomfortable if they are required to hear their linguistic self representations. There is no need for any physical mirror, or sound box, forto be reflected to its speaker, but I guess that speech for the speakers sake (as spoken in a conversation class), rather than the listeners sake, is likely to be more 'reflective'.